Football offers are one of the main ways you can keep making money each month through Matched Betting. It's easily the biggest sport in the UK for betting and with so many matches going on throughout the year there is always a chance for a free bet! A risk free football offer works exactly the same way as what you've been doing when signing up to the bookmaker websites. You simply place a back and lay bet and receive a free bet for doing so - quick, easy, and risk free! The most common risk free offers are Betfred's Bet £10 Get £5 in-play and occasionally Bet365's Bet £50 Get £50 in-play. Sometimes the risk free offer will require your first bet to lose for you to obtain a free bet. If that's the case then you would use the Risk Free Equal Profit Calculator on Oddsmonkey to guarantee profit from your bet regardless of a win or loss. Alternatively you can just back and lay as normal and hope that the bet loses. 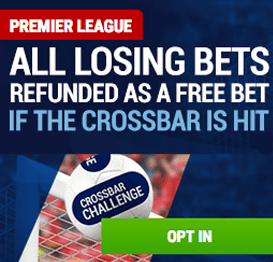 Refund offers are slightly different as the free bet isn't always guaranteed, it requires a certain outcome to trigger it. This could be something like a certain player to score, or a red card to be shown, or a certain amount of goals. Whatever it is, you will be able to profit from it! Below are some of the most common examples of a refund offer. The difference here is that you will only receive the free bet if the advertised outcome happens. If it doesn't happen, you'll only make a small loss and you can just move on to the next Football Refund. It's not guaranteed profit every time, but for long term profits you should definitely attempt as many of these as you can! You can also lock in profit some of these offers by betting on one outcome, and then laying the outcome that triggers the free bet. This is done by using one of the Oddsmonkey calculator's, such as the Win Bonus or Trigger Bet calculator. For a more in-depth guide on lock ins you can check the guide for each Football Refund offer in the guide list. 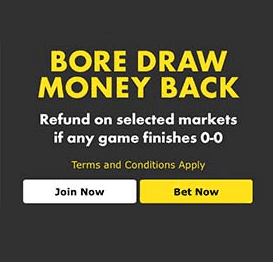 There are plenty of bookmaker refund offers, the most popular for matched betters are Bet365 2Up, Coral Win Win Get In and Paddy Power £10 Refund If Wins. 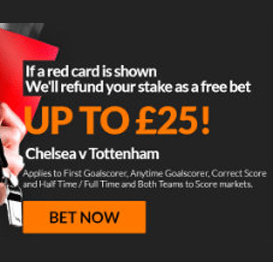 A typical advantage offer is "Bet £5 on our special markets, receive a £5 free bet". These offers are different to the others as you cannot fully lay them off at the exchange. A special market can be something like "Messi to score and to receive a yellow card at 6.0". Obviously you can't lay this bet as there isn't a market for it in Betfair, however you are going to receive a £5 free bet so the odds are in your favour. You know you are going to make around £4 profit from the free bet and so you're essentially only risking £1 to win £30 meaning you're basically getting odds of 30.0 instead of 6.0 for that bet! There most common advantage play offers are Betway 'BetYourWay' Bet £5 Get £5 and SkyBet 'RequestABet' Bet £10 Get £5. Football offers are on almost every day with the same promotions making an appearance every week. To keep up to date with what promotions are going on and when they are, I'd recommend signing up to Oddsmonkey to use their Daily Offer Calendar. It provides a real-time feed of all the running existing customer offers (not just the football offers) and is an invaluable tool for Matched Bettors! Alternatively you could just look at the main websites like Bet365, William Hill, Paddy Power, Boylesports, and Ladbrokes. If you're in our Facebook group or follow our blog then you may occasionally find a post about a Football refund offer that is valuable - so there's lots of ways you can get involved! The whole idea with Football Refunds in particular is to keep qualifying losses as small as possible. This is because not every offer will land so you can end up placing a few bets without receiving a single free bet. Oddsmonkey's Oddsmatcher will massively help you keep your losses down as it will find the best odds across all markets and websites. You can also set it to alert you when a price gets close via email - a really handy tool to have! The best thing about it is that it's included in their membership along with the Daily Offer Calendar. Another thing included in Oddsmonkey's membership is their forum. For anyone starting out on football offers this is a great place to head to. There are countless forum posts regarding football promotions, and lots of helpful discussion in the football refunds thread. You can compare prices and work out if an offer is worth doing with other Matched Bettors - some of which do this full time for a living!